Sixty hopeful people of all ages ignored the chilling rain and stood in line outside the dentist’s office early Saturday morning to take advantage of a free dental day in Glenpool . . . and more than $30,000 worth of procedures later, they went on about their day “shored up” for another year. Drs. Parnam Mohanna and Dalia Georgy care for adults, children and teens. They pull, clean and fill teeth once a year on those who probably haven’t stepped foot in a dentist’s office for quite some time – if ever. This event allows people to come in and get their teeth cleaned, filled or extracted even if they have no insurance coverage, according to Dr. Mohanna. 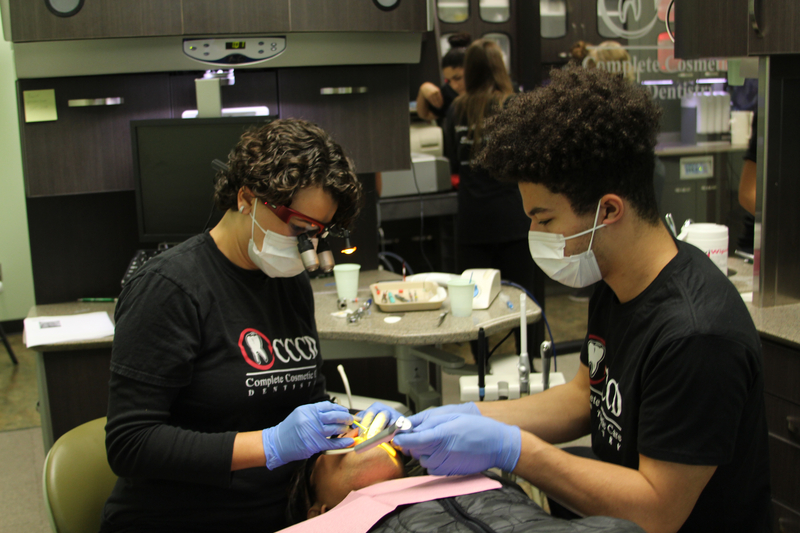 “This may be the only chance some of the patients are able to get dental work done for the year,” said Dr. Mohanna, co-owner of Complete Cosmetic Care Dentistry. This makes the sixth year for the dental clinic to offer this opportunity. It is always held on the second Saturday in October. Most of the day’s patients were adults with a handful of kids and teens added to the mix. Dr. Mohanna said that it is experiences like these that make one realize that money does not make you happy. Dr. Mohanna says he simply doesn’t know the answers to these questions, but that it should be our human nature to help and be part of a solution instead of the problem. One patient stood in line for hours in the pouring rain to have a tooth extracted. She was first checked out by the hygienist who then told Dr. Mohanna how much pain the lady was in due to multiple dental issues. The hygienist wanted Dr. Mohanna to determine which tooth to prepare for extraction because so many needed attention. After reviewing the case and talking to the patient, Dr. Mohanna went into what he calls “full-blown surgical mode,” and removed all the affected teeth, repaired her jaw bone and prepared the patient for being fitted for new teeth. Staffers couldn’t believe she wasn’t already in the hospital due to so much infection, they said. Office staff and volunteers get as much out of the event as patients, but in a different way. “It was such a neat experience. It made me so happy to be able to serve all those people in need,” said office staffer Sarah Loftin. “It was great to be involved with helping so many people in the community. In many ways, the event was more like a party than a trip to the dentist. The atmosphere at the event was terrific, according to staffers. The clinic provided a large breakfast for staffers and volunteers while Blues Hall of Famer David Skinner entertained patients with his guitar as patients ate Krispy Kreme donuts and drank coffee. The atmosphere was jovial and light. She said that when staff arrived at about 6:45 a.m., there were already 15 or so people lined up at the door. She heard that the first patient arrived at about 4 a.m.
Staff and dentists left for the day at 4 p.m.
Community-minded businesses such as Complete Cosmetic Care Dentistry are integral in making their communities grow and thrive. Dr. Mohanna offered his special thanks to all his amazing volunteers, Glenpool Chamber of Commerce, Henry Schein Dental, Kerr Dental and the entire team at CCCD for bringing some joy to our community. Dr. Mohanna said he wishes his patients and the rest of the world would be able to afford regular check-ups, surgeries and health needs through a good healthcare system. So he’s doing his small part just to move toward that vision. “If you don’t have health, what else do you have?” Dr. Mohanna said. Way to go Dr. Mohanna and Dr. Georgy. What a gift! ← Nerd Knowledge: What is streaming? How does it work?